The suspicion that modern societies and technological progress create a deeply unnatural and potentially unhealthy living environment is hardly new. 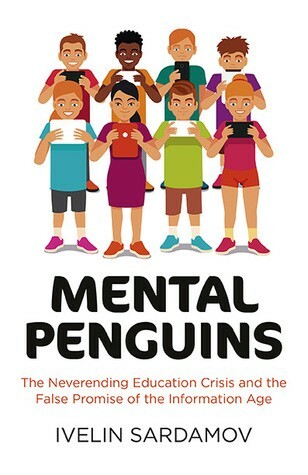 “Mental Penguins” is a book about the perennial education crisis and Sardamov’s perspective on it. His theory is that technology saturation leads to a chronic dopamine overload leading to warped brain plasticity which in turns causes a crisis of curiosity, motivation and implicit learning in the majority of students. This is based on Sardamov’s experience in teaching as well as his colleagues. This topic has been close to my heart since I am interested in education and since I am a parent with young children. So naturally, I was drawn to this book. The two things that I loved about this book are the logical progression of the topics and concepts and the writing. The science is not dumbed down but at the same time it is made accessible to strangers to the field of neuroscience. “Mental Penguins” is verbose. At times, I felt that I was reading a textbook albeit a well-written one. I think this book could have been shortened since there were repetition of the same ideas in multiple places. The other thing that I would have preferred not to see is the amount of personal bias seeping into the book. Given the tone of the book, it is surprising to see that Sardamov has not shone a light on himself to validate that his experiences have not been coloured by his biases. Ivelin Sardamov has put in a phenomenal amount of research in creating this book. This is evident on reading through it. He has gone into the details of neuroscience and has explained the cause and effect of each of the contributing factors to this crisis. It boils down to this — we have reached a stage in human development, where our brains are no longer able to keep up with the sensory input bombarding them. This has caused a lot of changes in the way we learn and our mental outlook. There is no solution that is presented because that is the aim of this book. I find that I agree with some of Sardamov’s conclusions. It is self-evident that too much of anything is bad and that children are most susceptible to outside influences when compared to adults. The sensory and information overload has obviously caused our minds to work differently. For example — why would we need to remember something when a simple google search brings it up? This rewiring can be good or bad, depending on the context. And this is where I start to disagree with his conclusions. I think that the rewiring of our brains is a natural consequence of our evolution. While Sardamov and others bemoan a fall in standards (which I agree with), I don’t think that this is exclusively caused by technology overload. There are a lot more contributing factors like personal biases which include age and experience, more people being given the opportunity to come for higher education (a greater sample size), the luddite fallacy to some extent, etc. This is a good book to read provided you draw your own conclusions, which I think Sardamov will want in any case.